A Houston, Texas, grandma will finally be able to watch the religious videos that she's been missing, now that she has become the first host of a residential "Super W-Fi" hotspot. "I've wanted to have the Internet for a long time, but it's very expensive" said Leticia Aguirre, described in a statement from Rice University, co-provider of the hotspot, as "a working grandmother and homeowner who's never had a reliable Internet connection at her home." Rice University created the Super Wi-Fi hotspot and installed it at Aguirre's home in conjuntion with the Houston nonprofit organization Technology for All (TFA), whose stated mission is "To empower under-resourced communities through the tools of technology." "I need the Internet to see that my paychecks have been deposited and to do other things," Aguirre said. "When they called me to see if I wanted to try this, it was an answer to my prayers." Super Wi-Fi is a technology that piggybacks Wi-Fi onto unused "white space" UHF television spectrum. When announcing the opening up of that spectrum last September, US Federal Communications Commission chairman Julius Genachowski said: "We know what the first major application will be: super Wi-Fi." Genachowski then explained Super Wi-Fi in layman's terms. "Super Wi-Fi is what it sounds like: Wi-Fi, but with longer range, faster speeds, and more reliable connections." Aguirre's Super Wi-Fi hotspot was installed as an extension of Technology for All's free community-level TFA-Wireless network, first installed in 2004. Although she had agreed to participate in the program, her home was on the edge of the covered area, and her reception was poor. 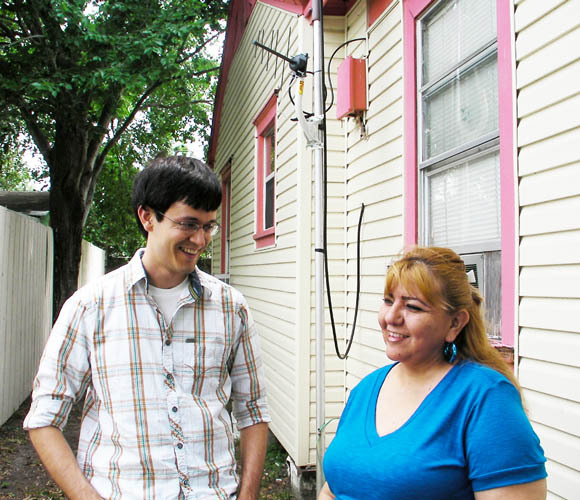 Now, with the help of Rice University and the TFA – and Rice graduate student Ryan Guerra, who built the Super Wi-Fi equipment now installed at her home – Aguirre can't wait for life online. Aguirre is: "Looking forward to using email and Skype to stay in touch with friends and family, including her three children and her five-year-old grandson, and to watching religious videos online and learning more about how a computer can help her in her daily life." The US government helped. "We have federal support from the National Science Foundation to develop this technology in an open-source way," Rice professor Edward Knightly, whose group – including Guerra – built Aguirre's prototype Super Wi-Fi equipment. "Ultimately, we want to develop this technology in such a way that it benefits the most people by accessing the right spectrum for the right users." Federal support of wireless internet access is but one part of the National Broadband Plan beloved by not only Genachowski's FCC, but by the Obama administration. Whether funding for that plan will survive the anti-government-spending frenzy that is roiling the current US budget battle remains to be seen. Last November, when the US House of Representatives swung from Democratic to Republican control, that chamber was joined by a fresh crop of conservatives, many backed by the right-wing Tea Party movement, who are in no mood to allocate taxpayer dollars for any expenditures that they believe should be reserved to what they revere as "the free market".